This beautiful post comes from Kris Felbeck, who writes about the profound experience of loss and grief in the family. 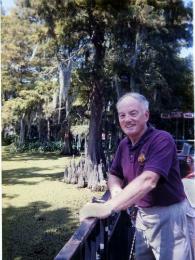 In Fall 2000 my father was dying. Thanks to Kathy Haskins for contributing the first selection, a poem written for the occasion of Ash Wednesday. Ash Wednesday reflection delivered by Abigail Henderson on 03/09/11 at First Cong. Church of MN. Psalm 51 is a tough one. It uses the “s-word” five times. You know the one I mean. Sin. These verses even declare that sin is original—“I was born guilty, a sinner when my mother conceived me.” Yeesh. That one’s hard to swallow. Yesterday afternoon, I read a book about animals to my niece, aged fifteen months, and she fell asleep right in my arms. As I felt her little body breathing against mine, sin was about the farthest thing from my mind. And you know what? It was a moment of rest and relief, because I actually think about sin quite a lot. Not sin as it’s popularly understood or described—the sin of pride, the sin of lust, the sin of… whatever. It’s risky to talk about sin because it’s a loaded term, one that’s been used as a weapon in so many unjust crusades. Today, I’m addressing another question related to Baptism: What is the role of the Godparents or Sponsors? This question leads me to ponder… what is anyone’s role in this ritual? God’s? The parents or the person (if an adult)? The congregation’s? The pastor’s? The wider community’s? I don’t know who created the above piece of art (my apologies) but I like it very much. It speaks to me about the interconnection of all of the above named “actors”. Is immersion a more significant experience (compared to the practice of sprinkling)? Should our church use immersion? From a purely subjective standpoint, I’m under-qualified to make a response. I have never experienced baptism by immersion; nor do I remember my own sprinkling as an infant. 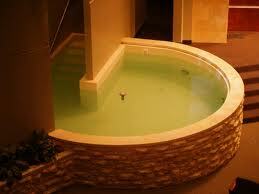 As a minister, moreover, I’ve never performed an immersion-style baptism in a baptistry. One example of a baptistry. In January, we held a “Back to Basics” session at church on Baptism. We watched film scenes with “baptismal” imagery as a way of exploring the meanings of Baptism in our daily lives. We also collected questions from participants — insightful, probing, wise questions, that we wanted to share here on the blog. Over the next few weeks, Abby & I will offer our responses to these questions and hope that you will join the conversation. Why should parents bring a young child to be baptized? As Abby wrote in her Chimes article, one thing we agree on as a church is that we do not baptize out of fear. We believe that both those who are baptized and those who aren’t receive the full welcome of God. As a community, we embrace and honor all, inclusive of each person’s choices and history with respect to baptism. OK, we promised blogging about baptism… but I’m going to take an opportunity this week to reflect briefly on the National Conference on LGBT Equality Creating Change, held this year in Minneapolis. Of great interest to me is the “mini-conference” within the conference, known as Practice Spirit, Do Justice (PSDJ). This gathering is dedicated to teaching and sharing the skills for a multi-faith-based pro-LGBT movement that has strong alliances with secular movements. I have always followed the progress of LGBT justice in various religious groups, but it was a new experience to have activists from all these different groups together, in one place. Each faith community brings its own unique strengths and limitations to the vision of full LGBT equality, but there are many points of connection. As a UCC person, I felt proud of our accomplishments and challenged to dream bigger about the future. I found myself thinking that this is an excellent bit of wisdom for congregational life as well. In a church, you have so many different people with their own stories, backgrounds, commitments, hopes… how do these various threads intertwine into a community? I think that’s one of the questions behind the Visioning Process we’re engaged in. We’re trying to do the intentional work of discovering, negotiating, and creating our shared meaning. This isn’t to say that shared meaning hasn’t been there before–most surely it has! But perhaps we’re trying to shed light on it in a different way–assuming less, listening more. Speaking of listening… do sign up for a small group listening session! I can’t wait to hear your voice.